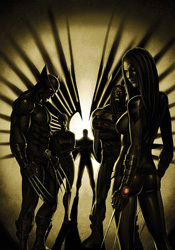 When there's a mutant menace that needs containment, one usually needs look no further than the X-Men. But when that deed is too foul, too risky or too controversial for the regular team to handle, Cyclops calls up X-Force. A lean, mean squad of select mutants that isn't afraid to get its hands dirty, the team is one of the Xavier school's most closely guarded secrets. Following the imprecise success of their first mission, X-Force is back at home this month, resting and recuperating from the physical tolls suffered in the field. It's a dramatic change of pace from the breakneck action of the first arc, and despite what the narration would have you believe, the team doesn't seem to be at ease within the supposedly friendly environment. It's like watching caged predators stalk back and forth inside their pen, restlessly waiting for their first opportunity to break free and do what they want. This isn't a series that should be focused on domestic issues. We get enough of that with the dozen other mutant books Marvel publishes each month. If the publisher wants to sell me on a series that promises to explore the dark, uncharted corners of the X-Men universe, they're going to need to pull in the reins a bit on the heavy handed BS that's prevalent in X-Force #7. I don't want to see Warpath commune with his dead brother in a heart-breaking moment of grief, I want conspiracies and action. Something that tells me why this isn't just another rendition of the same old story. I'm not getting that this month. In providing a break from the lush painted artwork that Clayton Crain had brought to the first arc, Mike Choi doesn't benefit from the comparison. With the aid of colorist Sonia Oback, Choi tries to mimic Crain's style as much as possible, but it just isn't working and in the end he'd have been better off trying something new. His renditions of familiar characters look and act more like wax models than living, breathing individuals. Even the typically rough-edged Wolverine wears a smooth, unblemished face during his strolls around the mansion. Maybe this is just how Logan looks when he's got time to shave? Either way, there's something unsettling about the combination of blank, faceless expressions and oddly reflective skin tones worn by this issue's combatants. Under Choi's watch, the series has lost the jagged, violent visual undertones that set it apart from the other books in the X-Men family. It feels artificial, forced and far too conventional for what the series is trying to do. This is a change of pace issue, and from all indications it's back into the fire next month. I'm aware of that, but it doesn't mean I have to like it. Writers Craig Kyle & Christopher Yost are much better suited to the dark action of this book's first six issues than the moments of internal strife depicted here. The slow pace and dull subject matter drag this issue into the depths, and the weak artwork makes sure it stays there. Skip it.